We recommend checking out our discussion threads on the VSN Mobil V.360 Sports Video Camera VN0214F06, which address similar problems with connecting and setting up Sports & Action Cameras VSN Mobil. The user manual for the VSN Mobil V.360 Sports Video Camera VN0214F06 provides necessary instructions for the proper use of the product Camcorders - Sports & Action Cameras. 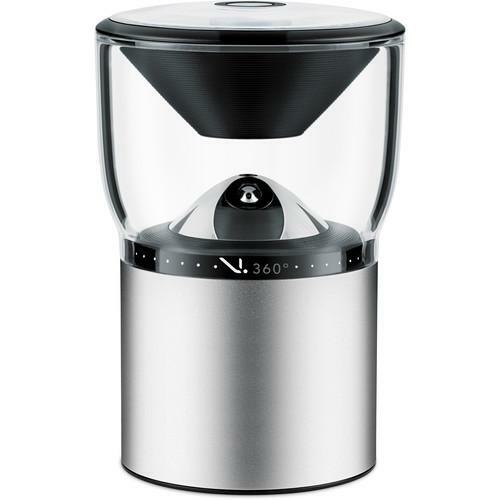 Take photos and videos which encompass a full 360° field-of-view using the VSN Mobil V.360° Sports Video Camera. Enclosed in the aluminum cylindrical body of the V.360° is a Qualcomm Snapdragon 800 processor which handles the capture and de-warping of your 6480 x 1080 images for seamless panoramic photos and videos. Sensors on the camera include a barometer, accelerometer, GPS, and altimeter. These sensors can add relevant information to your recordings. You can mount the V.360° using the integrated standard 1/4"-20 thread. If you have three-prong GoPro-compatible action camera mounts, the V.360° is compatible with those as well using an included adapter. With that combination, you can mount the camera to virtually any surface. Since the camera is shockproof, dustproof, and waterproof up to three feet for 30 minutes, you can bring it along on aquatic, rocky, or sandy adventures. A silicone cover is included to add further durability as well as reduce high-speed wind noise. Use the included Bluetooth remote to control the V.360°. It has one button to take a photo, and one button to record video. For more advanced options, the V.360° can also be controlled by your Apple or Android smartphone using the V.360° Companion mobile app. The camera can act as a Wi-Fi hotspot so you and your friends can view recorded footage or control the camera. The mobile app can also be used to make quick edits of recorded footage for immediate sharing. If you own a VSN Mobil sports & action cameras and have a user manual in electronic form, you can upload it to this website using the link on the right side of the screen. The frames per second will fluctuate based on lighting conditions and the resolution settings. 30 min. maximum submersion time. Box Dimensions (LxWxH) 5.669 x 5.512 x 3.858"
The user manual for the VSN Mobil V.360 Sports Video Camera VN0214F06 can be downloaded in .pdf format if it did not come with your new sports & action cameras, although the seller is required to supply one. It is also quite common that customers throw out the user manual with the box, or put the CD away somewhere and then can’t find it. That’s why we and other VSN Mobil users keep a unique electronic library for VSN Mobil sports & action camerass, where you can use our link to download the user manual for the VSN Mobil V.360 Sports Video Camera VN0214F06. The user manual lists all of the functions of the VSN Mobil V.360 Sports Video Camera VN0214F06, all the basic and advanced features and tells you how to use the sports & action cameras. The manual also provides troubleshooting for common problems. Even greater detail is provided by the service manual, which is not typically shipped with the product, but which can often be downloaded from VSN Mobil service. If you want to help expand our database, you can upload a link to this website to download a user manual or service manual, ideally in .pdf format. These pages are created by you – users of the VSN Mobil V.360 Sports Video Camera VN0214F06. User manuals are also available on the VSN Mobil website under Camcorders - Sports & Action Cameras.